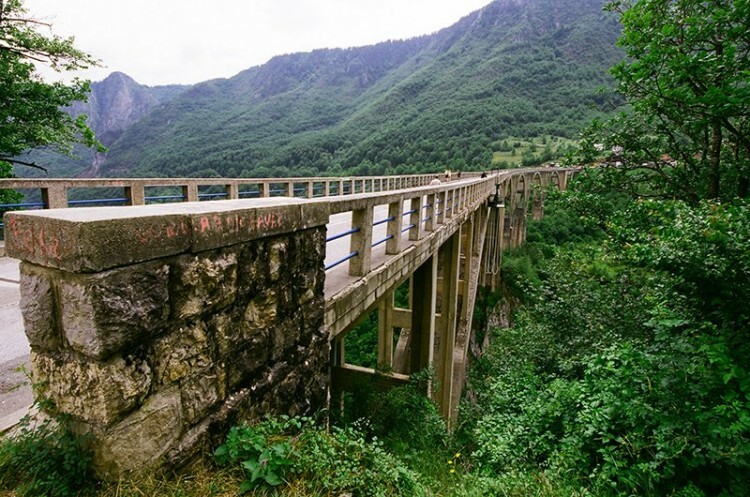 Đurđevića Tara canyon Bridge is a concrete arch bridge over the Tara River in northern Montenegro. It is located at the crossroads between Mojkovac, Žabljak and Pljevlja, between the villages of Budečevica and Trešnjica. Đurđevića Tara Bridge, which was designed by Mijat Trojanović, was built between 1937 and 1940 in the Kingdom of Yugoslavia. The 365-metre-long (1,198 ft) bridge has five arches; the largest span is 116 metres (381 ft). The roadway stands 172 metres (564 ft) above the Tara River. At the time of its completion, it was the biggest vehicular concrete arch bridge in Europe.